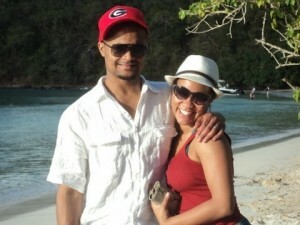 Newylweds Rasheeda and Cory on vacation in St. Thomas earlier this year. What a treat I have for you guys today! When I discovered that Tie the Knot Tuesday alum Rasheeda enjoys writing and realized that her one-year wedding anniversary was approaching, I asked the Georgia Peach to pen a piece about her first 365 days of wifedom for Triple B. Rasheeda in turn submitted a beautiful, honest and eye-opening letter to her engaged self. There are so many jewels in this letter, y’all. Enjoy! First things first, YOU DID IT! You crossed over into the secret world of old married folks. I feel like I should tell you everything, but I know you would hate it if I stole the surprise. There are a few things I think you should know though; I hope you’re ready for what comes next. Remember all those times dreaming of what married life would feel like? Look like? Be like? Here’s the glimpse into that. It’s like everything you dreamt of and nothing you could imagine. Those vows you wrote? You’re going to be tested on them. Nobody told you there would be a test, eh? Well, there are, lots of them in fact. So, I hope you remember what you promised. “I promise you fidelity, forgiveness, and friendship” – Yep, tested. “I promise always to be open to hear you and when I don’t understand to listen until I do”- Yep, tested. “I promise to remember what love is, to never be defined by it but rather for us to define it for ourselves and for our own lives and our family”- This is a BIG one, be ready. People will constantly ask you the first year “How’s married life?” You should probably prepare a quick witty response. You see everyone already knows the truth; it’s hard, it’s awesome, it’s scary, it’s huge. It’s as simple and complex as all of those concepts and feelings can be. The truth is, it won’t matter what you say, only what you do. The thing is, marriage is a choice; a daily, weekly, monthly choice. You and your husband choose the marriage you two want to create and you make it happen, together. On the good days you will feel euphoric, blessed, you will feel loved completely and wholly. On the bad days, remember there were good days once and there will be good days again, if you choose. The choice doesn’t come without work, hard work. Some people say their marriage isn’t work; yours will not be like that. You will have to figure that out on your own terms. Your trials and tests will not be like everyone else’s, stop comparing. Start living and loving. There is no script so take pleasure in that. Be a little more patient with yourself and your partner. He’s new to this. He loves you but he has his own tests. There was no syllabus, there wasn’t even a textbook, so he’s making this up as he goes along, the best way he knows how. Grade with a curve and give lots of extra credit. You’ll figure most of this out but you may need a little help. Here’s where that crazy wedding guest list comes into play. Call on all those people you want to be there to celebrate the happy times, you will need their support, love and knowledge. It takes a village to do more than raise a child, it takes a village to keep families together feeling supported and loved. They have been where you are now. Pick the people you trust, and ask for help. Knowing you need help makes you stronger, not weaker. There is so much to tell you but that would rob the joy and the intimacy out of it. Some things you just have to experience for yourself. Remember this: A successful marriage is not measured in years but rather by the experiences you shared and the children (if you choose) you raise. Remember how awesome Rasheeda and Cory’s wedding trailer was? Feel free to revisit it here! Love It. Thank you Rasheeda for sharing this. As a soon to be married woman, my engaged self appreciates you sharing your truth so candidly. So many couples only share the happy times, which makes others question their own relationships when the tough times come. Peaks and valleys are what comprise any relationship. Thank you for owning the valleys as well as the peaks. Truth. Well done, and Happy Anniversary! When I posted this seven months ago, I appreciated the wisdom Rasheeda so candidly shared in this post. But now that I am an engaged woman myself, I am REALLY appreciative! Please share this link, Triple B.